Nursing Home Visitation Ministry at The Waters of Clifty in Madison is today. Meet at nursing home at 2:30 or if you want to carpool in the church parking lot at 1:45 pm. KidStrong tonight at 6. Amy is the helper tonight. CARE Work Day – We will finish up our outside painting tasks Monday starting at 10 am. Hope to see you there and wear old clothes. Carpet Cleaning Monday mid morning in the Fellowship Hall and back hallway. Just be mindful if you come by the church that the carpet will be drying. Wednesday Night Bible Study – Job’s Prayer of Repentance as we continue in our study on prayer. 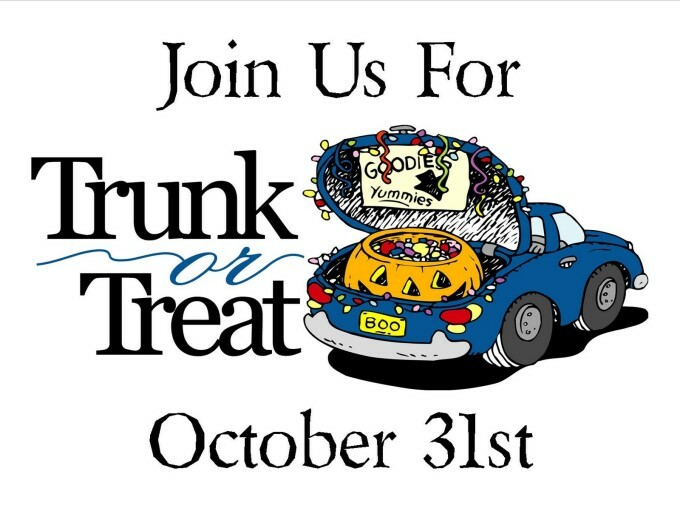 Trunk or Treat will be Saturday, October 31, at 2 to 4 pm. If you would like to bring your car you can sign up online or at the church office. If you want to donate candy then please drop it off at the collection buckets at the entry doors. Operation Christmas Child Shoe Boxes are due November 1 (this coming Sunday). Please bring your shoe boxes and place them on the donation table. Do not forget your shipping donation in the provided envelope from Operation Christmas Child. Come join us for Sunday School at 9:30 next Sunday.